This Series was originally birthed out of doing some digging into God’s Word concerning how other “religions” see God, our Heavenly Father, Jesus Christ, our Saviour and the Holy Spirit, our instilled Still and Quiet Voice. So many times people confuse themselves or are deceived into believing that there are “many” ways to get to God, yet they don’t know Him before they determine and settle that “belief”, if you will. Added to that set of challenges, a good portion of people who profess to know that they know God call themselves “New Testament” Believers. Majority of the verses discovered, 12 save 4, are in the Old Testament – which means they would have potentially overlooked or missed such foundational truths which they are used to present. Our consideration is individual, but the capability is presented in all – it is built into each of us; as all the dust settles, in our hearts, we know – sinner or saved – God exists. REMEMBER this is the Old Testament… We are three things: (1) “witnesses” (2) a “servant” & (3) “chosen”. Slide a little further down to see that we may (1) “know”, (2) “believe” & (3) understand”. It does not end there… He says He is (1) “LORD”, (2) “I Am” & (3) “God”. If we’d not considered the OT, we could have missed this TRUTH that builds our understanding of Salvation. Also, consider this… I’ve not pulled out a single commentary, other man’s words or placed emphasis on an opinion – and anyone that knows me KNOWS it is almost unbearable for me NOT to pour out right here as to HOW Christ is presented and seen through these verses… Oh, to see how these twelve RING the bell of TRUTH about our True God – God the Father, God the Son & God the Holy Spirit. When is the last time we got excited about studying the Word of God? I LOVE the Word and LOVE reading it. When I don’t read it, I MISS it. The answer is very simple. For the Christian, it is intended to be the Breath we cannot live without, because it speaks to us as God’s Word. The more the Bible is studied, taken in and applied, the more our lives will reflect the saturation of it in each of us. Proper mirrors reflect the true image of the person gazing into it. If the lives we live are corrupt, filled with lies and deceit, then the reflection will be a distorted, misaligned and tangled version of what it is intended by the Living God. 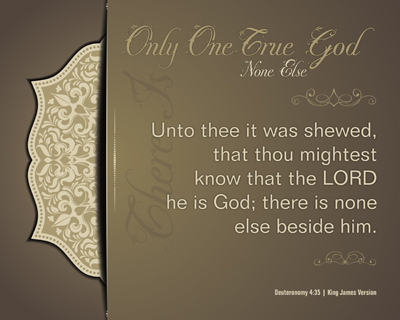 A clean, pure and holy reflection will solely come by worshiping the Only One True God. Simply stated, we expect to get full use, joy or effectiveness out of something we pay in full for when we acquire it. For the most part, we are expecting to receive that full use or commitment immediately. Anything less than being fully so, in this day and time is utterly intolerable and will be sanctioned by any and all means possible – whether that be related to the item in question or not, nor does it even have to be remotely close to reasonable. Somewhere in this is the Christian’s need to consider our “Reasonable Service” (this has been used in another Series in the past) which is plainly placed before us in Romans 12, verses 1 and 2. Our Lord committed His life to our ability to have Salvation, being Redeemed and having our names written in the Lamb’s Book of Life. As Christians we have the benefit of SO much, where the world doesn’t realize even a single real benefit of any of it. Could that be because we as God’s Children have not realized there is a commitment to be made? 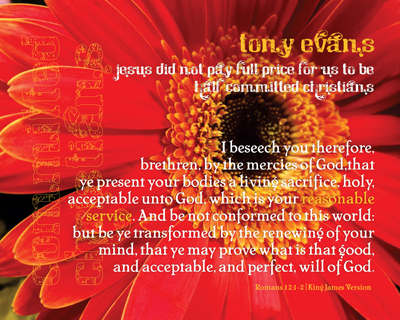 We don’t have to have blood sacrifices anymore, because the final, sinless Lamb has already been slain – all we have to do is be a “living sacrifice” that is “Holy, acceptable to God…” We are further warned in Romans 12:2 that we “be not conformed to this world…” for it is not good, not acceptable, nor perfect, Will of God. We are NOT perfect for certain, but we are made Righteous in God’s eyes and should be committed to Him through His Son. That commitment does not come without instructions or helps – Our Lord’s desire is for us to “reason together” (Isaiah 1:18) and be “ready always to give an answer to every man that asketh you a reason of the hope that is in you with meekness and fear.” (I Peter 3:15) What we do is up to us and how we decide we are going to listen to the Holy Spirit that resides inside the heart of every Believer. This Series has seven (7) passages of Scripture that comprise as many ways to being fully committed Christians. What a POWERFUL reminder to bring conviction upon our hearts about being Committed Christians! Unfortunately, at times we may each find ourselves not considering the Full Price that our Lord Jesus Christ paid with His life, death, burial, and resurrection for our Salvation and Redemption. I personally like for things to be completed and done so in the best manner possible, which applies to how I want to represent His Word and Testimony. Just imagine what could be done for the cause of Christ if we each would show our commitment to Him more fully. A couple of things have come to my mind that I can change, will you join me in taking a long look into your own devotion and commitment, to see what might be there that could be changed? This Series can help each of us make that review.